Happy October! Or should I say Happy Oktober? While Japan needs little excuse to have an Oktoberfest in May or June, the number of festivals only increases as Fall approaches. This year has seen the popularity of Oktoberfests grow even more, with communities around Japan experiencing a surfeit of sausages, blue and white flags, and weizen. Now the oompah music has finally reached my end of the Kanto plain. Maebashi will host its first annual Oktoberfest on October 18th and 19th. I am always excited when more diverse beer options are available in this area. As far as beer goes, anything and everything is available in the greater Tokyo megaplex. However that does not often translate to the periphery. In the bigger cities demand is such that you can start a niche shop or bar and do well. But with a smaller, less dense (and older) population that sort of risk is much less likely to succeed and we are left with the same old beer everywhere. So when a new thing does arrive, it is pretty exciting. Craft and import beer is becoming more and more popular across the country, but it is still a very small part of the overall market. When things like Oktoberfest celebrations leave the big cities and start showing up in the smaller more out of the way areas it is a cause for celebration. That said, I do have a few concerns. Often these sorts of festivals are very overpriced. The German culture that is on display can seem like almost a caricature, though honestly that can often be said of American Oktoberfests as well. 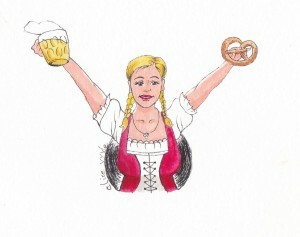 It is pretty easy to fall back on pretzels, sausages and lederhosen. Another worry is the general dearth of information at the moment. The Maebashi event is on the 18th and 19th, and tickets are 2,000 yen in advance, 2500 at the door. There will be plenty of entertainment, including a bartender show and some yodeling. And that is it. There will be beer, but any information on what beer, and how much that beer may cost, is currently unavailable. I have certainly become used to paying a premium for suds, but it would be nice to know what I am getting into before I buy a ticket! Even so, I do think that this is exciting times. Events like this are a first step in introducing different and better beer to ever more people. The mere fact that this is being held here in Maebashi is fantastic, and hopefully a sign of things to come. This past spring we visited the Yokohama Frühlingsfest and Alice, proprietor of the Japan/ Art/ Food blog Supperhappyawesome was inspired to draw a mädchen, one of the famous beer hall serving girls. The beautiful illustration that accompanies this post is her most recent version of that picture. This entry was posted in Festivals, Japanese Beer Culture and tagged Maebashi, Oktoberfest. Bookmark the permalink.